About a month has passed since I got the silicon covers for my trio of Pocket Operators from Teenage Engineering and let me tell you, they are sweet! 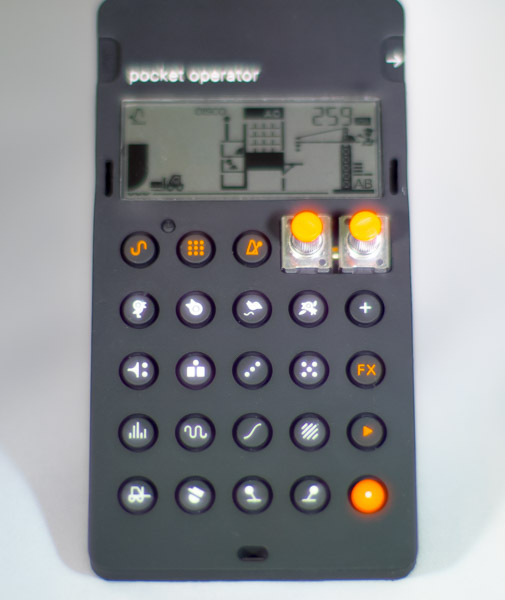 Not only do they protect the slightly scary circuit-board styling of the naked Pocket Operator, but they actually give it a totally new flair, not unlike a … hmmm… pocket calculator of yesteryear. This is, of course, the way the Pocket Operators are meant to be used. The case fits snugly, and I actually had to wrestle with it a bit to slip it over all edges. Once fit, it will not come off by itself. While the original unit is perfectly usable out of the box, the case adds heft and a much better grip to the unit. One can argue whether Teenage Engineering would be better off including the case in the package, but I think this is a piece of really clever marketing. It is perfectly usable “naked” out of the box, and that in itself gives the unit a unique combination of DIY, almost to the level of punk rawness in a niche that is filled with slick and polished gear. The optional case actually gives you opportunity to style the unit in two very different ways. A trio of Pocketable Operators, fitted with screen protectors for extra pizzazz. In use, the cases prevent the Pocket Operator from slipping on the table, standing it firmly at a very useful angle (you also have to remove the flimsy stand, which can be re-attached for later use if needed). I also found to my surprise that the built-in sound improved quite a bit, possibly from positioning the speaker towards the table in a better angle for sound to be amplified. The buttons finally get icons that are more visible in dim lights, although it can be debated whether they are any less cryptic than before. One clear drawback is that the buttons are mushy, meaning that the affirmative click of the “naked” buttons are no longer present, something that could add unplanned mistakes to a performance. And, speaking of dim lights, the status LED’s beneath are clearly less visible making it at times somewhat of a guessing game to program the unit. Transparent buttons would have solved the problem, but probably at a higher cost. Yes, the covers are on the expensive side, at more than $40 each possibly putting them slightly outside the “impulse buy” award. But since the units themselves are really inexpensive for what you get, I don’t hesitate to recommend getting a case for your PO! I found I could put the case on without removing the wire stand.